Living for a few years in the South-westish, if there is such a place, marked me for life as a fan of a certain style of Southwest- style Mexican food. There were two restaurants in my teen years that served white enchiladas, made with a spicy green chile sauce that I swooned over. Served with homemade corn tortillas on the side (more carbs, please!) I was inspired when a local natural foods store began carrying additive and preservative-free corn tortillas to make my own enchiladas. Another breakthrough was Lauren Groveman’s versatile recipe for fajita seasoning, which I use for chili and enchiladas in addition to enchiladas. I still have my Tucumcari, New Mexico Rattlers t-shirt (best high school mascot, ever!) even though I just passed through. Though I now live in the land of sushi, grass fed beef, and green smoothies, there are certain times when my spirit cries out for the kind of Mexican food you can’t buy out West. Sauté onion until soft over medium heat. Add garlic, stir briefly, add green chiles. Add 2-3 tsp. of fajita seasoning and let spice blend saute with vegetables for a couple of minutes. Remove from heat and set aside. Prepare cheese sauce as for a standard white sauce, adding cheese at end. Reserve ½ of sauce. To remaining sauce, add sour cream off heat. Add sautéed vegetables to reserved sauce (the batch without sour cream). Fold in diced chicken. Either fill tortillas with chicken mixture and roll or layer with tortillas in casserole. 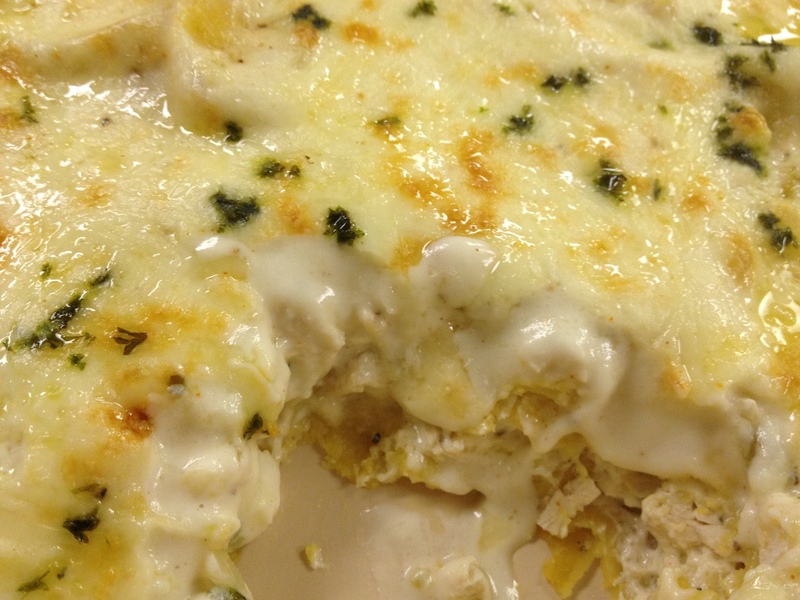 Top with cheese sauce and sprinkle with a little Monterey jack cheese and cilantro, chopped. Bake at 350 degrees for 25-30 minutes. “Lord, this is good,” you’ll find yourself saying, sneaking a few spoonfuls before dinner. You’ll thank he beautiful diversity of America- the cultures, places, and ingredients that inspire regional cuisine. When You’re Here, You’re Family. 20% Gratuity Optional. An Olive Garden Adventure.